I started typing up the recipe for this, but while I like it, I don’t love it. My philosphy with buying anything from clothes and shoes to art and kitchen appliances is “don’t buy it if you don’t love it”, so I’m taking the same approach to my blog… if I don’t love it, I’m not posting the recipe. I do like taking pictures though, and like the pressed lasagna I made last week, I think it’s pretty and wanted to post it! You can find the recipe in Matthew Kenney’s Everyday Raw. It’s an easy one to make as it only requires a food processor. And… it’s Thursday afternoon before Easter Friday and a three-day weekend! 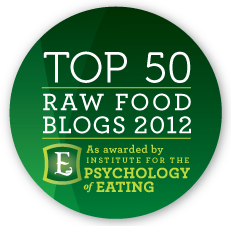 I’m very excited and hoping to embark on a few of my own raw food creations… exciting times.